July Patients — Raptor Education Group, Inc. 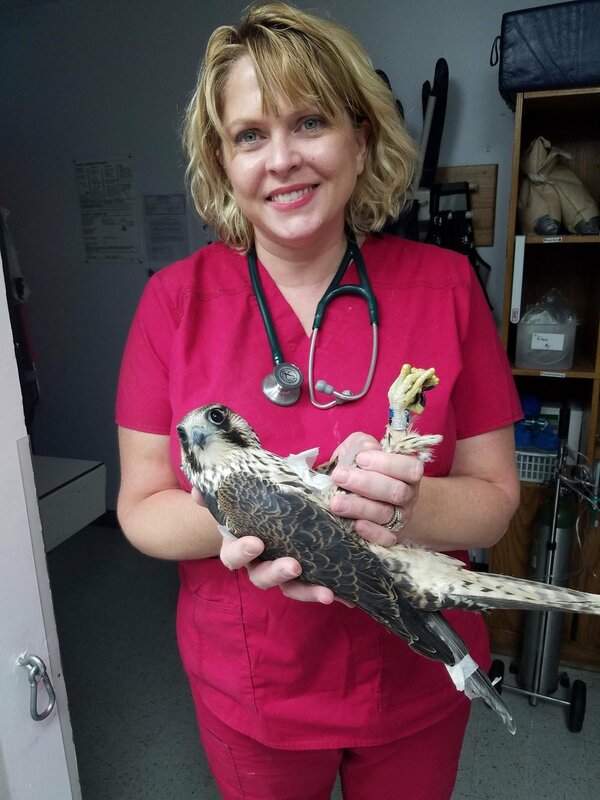 The Peregrine Falcon admitted was a very lucky guy. Somehow this young falcon managed to come away from the collision with only a fracture of the ulna (bone in the wing/forearm equivalent). The best news is the radius is intact which means it will help splint the ulna and stabilize the wing. He will fly again! We are 98% sure he will be out of rehab and on his way by this fall. It was confirmed that this young male was hatched at the WPS Weston Power Plant in Rothchild. He was named "Morgan" by school children that participated in the "Name the Peregrine Project". I have included a photo of young "Morgan" on June 1. 2017 when he was banded. Peregrine falcons can dive at 240 miles per hour. Young peregrines have speed but lack experience on how to use that great power. Life is a learning experience for them. We hope when he gets this second chance at life in the wild, he will develop an understanding of how to use his air brakes. We have four nestling Merlins. The chicks fell from their nest tree into a camp ground near Pelican Lake, WI. They have several medical problems including starvation and impact injuries. We are grateful to the kind folks that found them and brought them into care. A young Least Flycatcher was admitted from Stevens Point. He has trauma similar to "shaken baby syndrome" and is recovering. He was rescued by a terrific family that was at a park in the area when they observed young boys tossing something back and forth and then discarding it in a pail of water. An investigation of the pail revealed that the "thing" was a Least Flycatcher. A tiny passerine that eats only insects. It was reported that they boys were at the park with their grandmother. She did nothing to stop the horror. It is possible she did not realize what they were doing, but it is essential to give young people guidance in moral/ethical behavior. Least Flycatchers like all migratory birds are protected under federal Migratory Bird Treaty Act. Please, if you see abuse of wildlife, stop it immediately. Unfortunately, we see far too much abuse in our work. We took a call concerning a hawk in a garage in Antigo. WI. It was a young Coopers Hawk. He was thin and weak, but no fractures or other injuries were found. He will be with us for a few days and reevaluated for release. 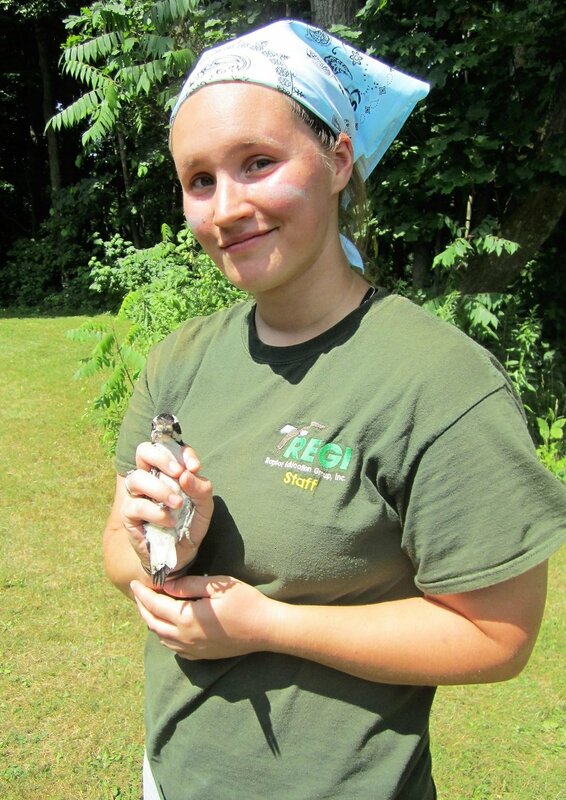 This hawk was rescued by interns, Emily Kitchen, Kent State University, Erika Burton, Humboldt State University and Natalie Erickson, UWSP. They did a great job. Several owls have been admitted including both Great-horned Owls and Barred Owls. Most owls are hit by cars this time of the year. The youngsters are learning to hunt and get confused by car lights in their enthusiasm to hunt mice and other rodents. Fourteen former patients were released. Our Adventure Campers were able to see the birds go back into the wild after they were admitted as tiny orphans due to storms damage or other displacement. Six Eastern Phoebes, six Black-capped Chickadees and Two Hairy Woodpeckers were released.